Posted by Bigb in forums.watchnet.com Feb. 11, 2019, 2:23 p.m. Excellent condition, No box or papers. There is a very light small scratch near the 4 o'clock marker. It is not noticeable and not easy to see. I am confident it won't bother you. 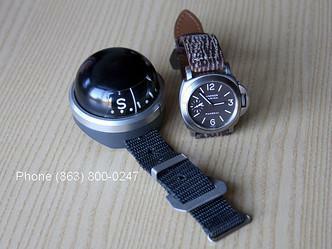 PANERAI PAM 176 LUMINOR BASE TITANIUM BLACK SANDWICH DIAL, 44MM CASE. Out of production and hard to find! Panerai PAM 48 Luminor Marina Automatic Date 40mm. Panerai PAM 590 Luminor Marina 8 Days Acciaio North American Limited Edition 44mm. Panerai Teakwood Display Box 6 watch Holder. 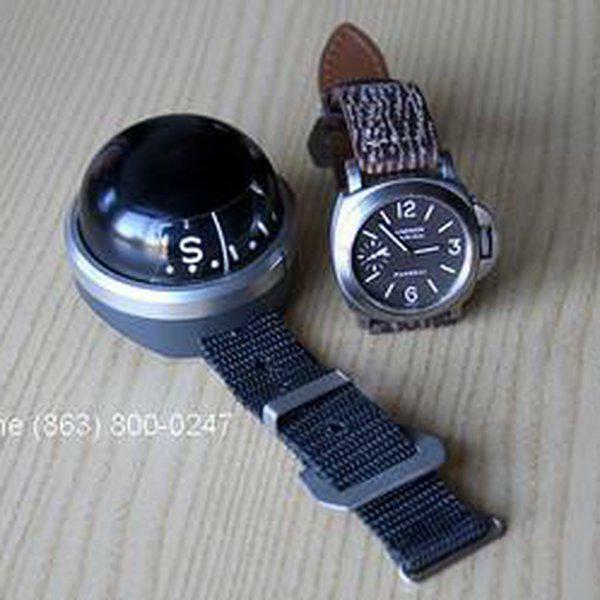 Panerai Vintage Window Compass. Super Rare! Watch not included. Show for size reference only. Panerai Vintage Signal Lamp Circa 1950. Excellent condition. No box or papers. I will gladly ship worldwide. Prices are based on bank wire payments and do not include insured shipping. Credit Card through Paypal or Paypal accepted (restrictions and fee's may apply). Watches 24 Seven, LLC is not an authorized dealer of Panerai or Richemont Brands or any other brand of watch that we sell. All watches we offer on Timezone are pre-owned and in like new condition unless otherwise stated. We are worldwide respected secondary market sellers of luxury brand watches. Founded on the basis of collecting our own authentic high-quality timepieces, and a member in good standing of the IWJG, it has been our privilege to help other collectors build their timepiece collections.